Home » Games » Kids Aquarium Fun - Create Your Dream Fish Tank! Hey Kids! Do you like fish tanks and amazingly beautiful aquarium full of cute and colourful fishes? 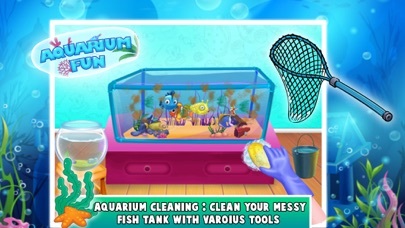 If you or your kids love fishing or visiting the fish aquarium, you will love Kids Fish Aquarium Game. 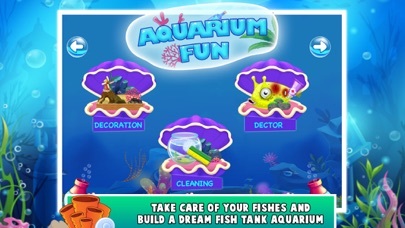 3 different levels of game play, fun mini-games and cute fishes will give you a chance to play with real aquarium. Take care of your own dream fish tank and beautiful fishes. How To Play? - Clean your fish tank but make sure you take out the fishes first. - Fishes are hungry so start feeding them! - Take out all the fish tank decorations and clean the water. 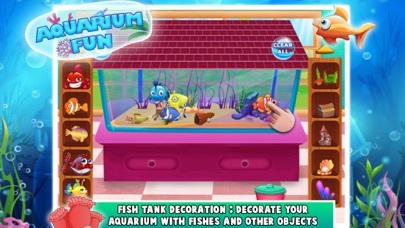 - Finally Design and decorate the dream aquarium using colourful fishes and objects! Features : - 3 Levels : Cleaning the Fish Tank, Treating the Fishes, Aquarium decoration. - Fill your fish aquarium with lots of tropical fishes and design your fish tank in your own favourite design. - Take care of your fish tank and fishes. - Enjoy pleasant and fun music while your kids will enjoy playing! 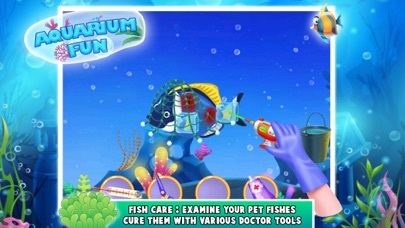 - Vibrant colors and fun sounds will entertain your kids as they play with cute fishes. You can choose between many different decorations and beautiful fishes! Decorate your own aquarium and take care of all the fishes!